I hope you are in the best of health. 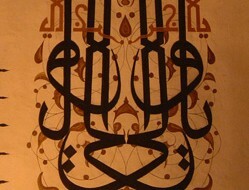 I would like to inform you that Haji Noor Deen artwork and calligraphy is now available. It would be much appeciated if you could make this known to your visitors or fellow bloggers. Ma’shallah! That’s what it’s all about. Beauty, friendship, the sacred shining through the human imagination, shining through the human soul. All are one and all are blessed! My heart is singing so loudly I might be afraid it would break– only I know that as long as the hearts of my brothers and sisters remain such vast oceans of light I will never have anything to fear. Haji Abdal-Hayy and Haji Noor Deen representin’ true! –Original Japanese haiku by Khaliff A. Watkins. Original English haiku by Khaliff A. Watkins.